CTB : What is Christmas to You? This Sunday, Carry Patton prepared and shared his heart with us. He asked a question that I have actually gotten a few times this year, "What is Christmas to you?" So I asked myself "What is Christmas to me...?" I started thinking about what it has been in the past. I thought about how it used to be about my mom making her homemade apple cider, our whole family going to the Christmas tree farm having hot chocolate and picking out the perfect tree for the big room. It used to be us singing and putting our socks on and pretending to "ice skate-dance" to Christmas carols around on the hardwood floor. It used to be wrapping gifts for Libby and Landon that I would just find around the house or I made them out of who knows what with a glue gun and scotch tape. It used to be Barbies, Legos, BASKETBALL accessories, baby dolls, hot wheels, etc. It used to be PawPaw getting out his Bible, clearing his throat (a few times) and telling the story of Christmas. It used to be DeeDee dumping a trash bag out in the middle of the living room and drawing numbers to see which order we got to pick something from the bag. It used to be decorating the tree and getting so extremely excited for dad to put the star on the top. As I grew up Christmas became my favorite part of the year. I seriously lived my whole year just waiting for it. It turned into all of the things before, plus basketball tournaments, craft fairs, the Mariah Carey, Amy Grant, Celine Dion, N'Sync, Bing Crosby, and Dolly Parton Christmas CD's all on repeat for Landon and Libby to gripe at me to turn down. I turned Christmas into something so big. Then one Christmas we had to start going to mom's house too. We had to start doing Christmas with another family and pretend that they were our family, I continued to love the season and the holiday time regardless of those things, and continued to let Christmas be an idol in my life (not realizing it). Then the night of Christmas just a few years ago, I experienced a night I am probably never going to forget. To say that I wasn't feeling the "Christmas Spirit" would have been an enormous understatement. Ever since then Christmas hasn't been the same. I lost my excitement for Christmas. I lost the happiness I once got from decorating the tree and listening to Christmas carols (I still make a playlist every year with different Christmas songs on it). Many times this "holiday season" I have thought about just what Christmas really is. I have heard numerous times this year that Christmas is family, friends, sharing with loved ones, helping others, serving people, giving, loving, making memories etc. These things are all wonderful. Giving, serving, helping, loving, these are all things we should be doing. This brings me back to, "What is Christmas to me?" I am so thankful to be able to say that I lost my happiness for the "Christmas season" because this year I have the joy of Jesus. It's crazy to me how the timing of our always-faithful God is so perfect. I have been really stressing the past few months and I feel like I have repeated Psalm 51 over and over in prayer. Especially Psalm 51:12, which says, " Restore to me the joy of Your salvation and sustain me with a willing Spirit." For a while I have just been thinking, well, sometimes we just have to endure these times, and we do. I thought a lot about a post I wrote a while ago about praising Him even in the storms and valleys; was I going to live up to that; was I going to trust Him at His word even through this dumb valley I couldn't get out of? Someone shared Romans 8:38-39 a while back. So I also read and repeated that to myself over and over. I had to keep reminding myself there is NOTHING that can separate me from His love. NOTHING! I hope that sinks in. He is so faithful. I seriously just want to jump, or clap, or cry, or shake my shoulders, or I don't even know what I want to do; I just get so overwhelmed by the joy of knowing Him. He completely restores us when we need it and I needed it. He restored to me the joy that only He can give me, and that only He can fully satisfy. With this joy, I am thankful for Him giving me a new understanding of things I "already knew." This year I have just been floored by how much I have truly "missed it" in the past. I have missed that "Christmas" in the sense of loving, giving, and serving people should be celebrated year round. Christmas should be more about taking the opportunity of the "holiday season" to tell more people about Christ than you could normally. 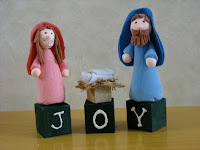 It is about the celebration of the birth of the Holy and Sovereign and Living God in human form. It's about redemption and about love and life. Seriously what better opportunity than now to be telling people about a God who loves them more deeply than they could ever even fathom in their little human brains; that He would send His perfect son to die to redeem them from their sin. This Christmas, Christmas means taking time to thank God for the greatest gift I could ever receive, telling people about it, and sharing the joy that He has so graciously and lovingly restored to me. Christmas to me is JESUS, and the coolest part is. That sounds like a "duh!" statement, but ONLY because of a supernatural work in my heart and mind am I able to say that and truly mean it like I have never in my life meant or understood that before. Christmas is me being fully and completely convinced that neither death, nor life, nor angels, nor principalities, not things present, nor things to come, nor powers, nor height, nor depth, nor any other created thing, will be able to separate us from the love of God, which is in Christ JESUS our Lord (Romans 8:38-39).